Fritz Freudenberger | Geophysical Institute Dec 17, 2018. A volcano is like a stream. It might sound like a Zen proverb, but it’s a useful comparison for University of Alaska Fairbanks Geophysical Institute graduate student Julia Gestrich. Scientists can use stream flow to understand volcano ash plumes, Gestrich explained while presenting her research at the American Geophysical Union Fall Meeting in Washington, D.C., this week. Gestrich and her academic advisor, Alaska Volcano Observatory coordinating scientist David Fee, noticed the similarities. Streams and volcano plumes move particles, they flow, and both processes can generate seismic signals. In streams, flow is dictated by the energy of the water moving grains of sediment and other particles. As these particles travel, they strike the streambed, generating seismic energy. Seismic signals are especially elevated after high-energy events such as a rain storm. However, the signals lessen after time when the larger grains, which produce the most seismic energy, settle or are transported away. Scientists have long used computer models to synthesize and understand flow particles and seismicity in streams, but now Gestrich is applying these insights to help understand ash plumes. When Gestrich and Fee looked at the seismic signals from streams, they noticed similar patterns to those observed in volcanoes. Even some visible physical processes were comparable. Fee noted that during an eruption, erosion degrades the volcanic chamber, much like in a stream bed after a storm. The project focuses on the Pavlof volcano, which erupted in 2016. 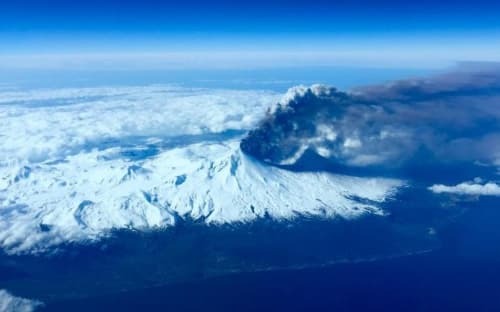 According to the Alaska Volcano Observatory, the eruption sent ash up to 35,000 feet in the air with an ash cloud extending more than 400 miles to the northeast over Interior Alaska. It was the first volcano where the researchers noticed the unusual relationship between plume height and seismicity. It is their best example of this relationship so far. Gestrich adjusted a model that calculates stream seismicity to look at the volcanic ash plume. She used the model to calculate for turbulence in the volcano and compared it to the real data from turbulence in the Pavlof eruption. At first, the two didn’t match. However, when the grain sizes of particles in the volcano model were enlarged, the results were similar to the seismic signal collected from the eruption. While not a perfect fit, Fee said, the model is a promising start. Even though they don’t have all the details, he thinks they are on the right track. “We have adjusted the model to realistic parameters and can produce outputs that show favorable results where the model agrees with real data,” he said. In the end, the goal is to understand what is coming out of a volcano. This is especially important in places like the Aleutian Islands, where scientists may ­­­only have data from limited seismometer or infrasound equipment to monitor volcanic activity for the 54 historically active volcanos in the region. So far, the results of her study support the usefulness of adapting such a stream model, but Gestrich hopes to refine it for applied uses. She would like the model to estimate mass coming out of a volcano, or the gas-to-particle ratio in an ash plume. Fee hopes the model will help scientists better understand flow, velocity, grain size and other properties of an eruption.